Again, I have two weeks' worth of events to catch up on. Things have been fairly quiet but I think it's not too soon to begin preparing for what's going to be a highly eventful week for space exploration, the second week of October. It kicks off with MESSENGER's second flyby of Mercury, on October 6, during which the sunlit hemisphere will be almost exactly opposite to what was visible in January's encounter -- all-new territory will be revealed again. On October 9, Cassini will do a death-defying close flyby of Enceladus at an altitude of 25 kilometers. This encounter is primarily for the "fields and particles" instruments, so expect images, but not as good as last time's. On or after October 10, the space shuttle Atlantis launches for the last Hubble servicing missions. And perhaps around the same time, India will launch its first mission beyond Earth orbit, the lunar orbiter Chandrayaan-1. Cassini took this photo of Dione from a distance of 832,139 kilometers on September 11, 2008. Sunlight strikes the bright fractures of the "wispy terrain," including, from the top, Carthage Fossae, Palatine chasmata, and Eurotas chasmata. 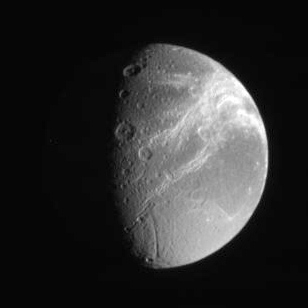 The lighting also makes apparent the fact that the fractures cut across leading hemisphere terrain that is darker in color than other parts of Dione. Glancing sunlight near the terminator (day-night boundary) emphasizes the walls and central peaks of craters and the straight sides of several chasmae, especially Aufidus Catena, near the south pole. Cassini is now in rev 86. It will reach periapsis (its closest approach) of Rev 86, crossing to the sunlit side of the rings, on Thursday, and have a distant flyby of Tethys at about the same time. Rev 86 ends at apoapsis on Sunday. Cassini is on a really high-inclination orbit now, oriented nearly 75 degrees above the ring plane. We're still on roughly once-per-week orbits, and that's not going to change until late this year. Browsing through the raw images, I find a nice color set on Tethys, lots more lovely pictures of Saturn's polar cloud features, an exceptionally pretty photo of Dione (posted at right), a cool set focused on Enceladus' plumes, a "mutual event" of Dione and Enceladus (very rare these days, now that Cassini orbits well out of the ring plane), a nice color set on Rhea, a couple shots of Pan, several F ring movies, an even cooler set focusing on Enceladus' plumes that I think I'll have to write more about later, some very close views on density or bending waves in the rings, a lovely half-phase series on Enceladus that culminates in some eclipse shots, and a nice low-phase set on Rhea. On the surface of Mars, it is midwinter (first time I've said that!) in the southern hemisphere (Ls 131°). Today is sol 1,679 for Spirit, 1,658 for Opportunity. As I mentioned last week, Opportunity is now gathering itself for a long drive off to "Endeavour" crater. Spirit is still parked on the edge of Home Plate, in the same position it has occupied since sol 1,464 (February 15), with its solar cells pointed northward toward the winter sun. For Phoenix, we're just starting sol 117. I'll get caught up with Phoenix later this week. A press briefing for Phoenix has appeared on the NASA TV calendar for a week from today (Monday, the 29th, at 2 pm EDT), so I'll probably wait until then to do a truly thorough update. At the rovers' landing sites, Mars Reconnaissance Orbiter's MARCI imager reported some clouds in Opportunity's skies, but pretty clear weather for Spirit and Phoenix. The Mars Reconnaissance Orbiter HiRISE team recently released a thousand new images! That's a mind-boggling quantity of data. Go to the website and select an image at random. Odds are, hardly anyone else has really looked at that image ebfore. Whatever you see, it'll be nearly new to human eyes.New Horizons is 11.2 AU from Earth and 20.5 AU from Pluto, and is in the middle of a busy schedule during its annual checkout. It has new flight software, the culmination of a scary procedure that the mission team likes to refer to as a "brain transplant." They are posting brief updates on the progress of the checkout on their Twitter page. If I understand the weird Google translations of these updates on Hayabusa correctly, the spacecraft is warming now as it is returning from its recent pass through aphelion; what's important about that is that Earth is still in touch with the spacecraft.